This narrow, ten-year-old hot dog and sausage shop is lined with ledges and colorful stools for those chowing down in a hurry. 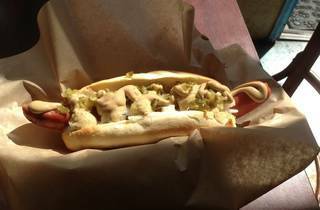 The dogs are organic, but the beers are a bargain: $1 PBRs and $3 drafts. 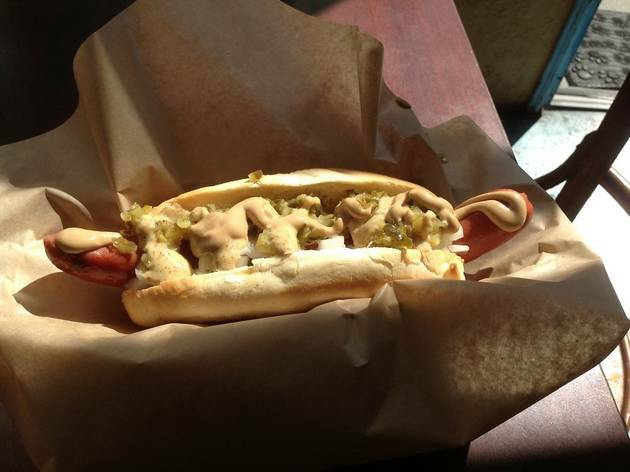 Order the Frisco Frank, a grass-fed beef dog on a white bun, if you’re feeling basic. That said, most along Underdog row roll up their sleeves for specialty combos like the Wild Style—a dog slathered in bacon, grilled onions, cheese and Underdog sauce—or the All the Way, which is piled with bacon, mushrooms, cheese, potato salad, chili and grilled onions. Bonus: the spot offers burnt bacon as a topping.